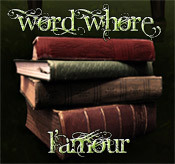 Word Whore Post! and BoD Excerpt! Also, also – killer review of Brush of Darkness over at Fresh Fiction today! This entry was posted in blog and tagged brush of darkness, word-whores. Bookmark the permalink.